Every since I was little I can remember my grandma making this amazing Icebox Cake’s and if you talk to my mom she can remember her grandma making them as well. They are super simple to make and only require a few ingredients but they will defiantly have people coming back for more. I made these to take to an event and my husband got so upset that I was taking them and not keeping them at home. The next day I had to go out and get some more Chocolate Wafers to make them again for him. The key to this recipe is finding the Nabisco Famous Chocolate Wafers. They are usually in the cookie aisle and usually on the top shelf. Now not all your local grocery stores will carry them so don’t be surprised if you have to go to a large chain. My local Winco didn’t have them but Savemart did. 1. In a large mixing bowl, whisk the heavy cream until it just starts to thicken. Add the sugar and vanilla and continue whisking until soft to medium peaks form; the cream should be floppy and light. 2. Place a chocolate wafer on a sheet pan. Drop a rounded teaspoon of whipped cream. Use the back of the spoon to pat the mound of whipped cream into a flattened disk, leaving about 1/8 inch space around the edge of the cookie. Gently press another wafer on top of the whipped cream until the frosting is flush with the edges. Continue until you have stacked 3 cookies to make one “mini” cake, finishing off with a coat of whipped cream. 3. Repeat the process with the remaining chocolate wafers. If the whipped cream starts to firm up while you are assembling the cakes (you want it to be fairly loose), stiff in a tablespoon or two of heavy cream as needed to keep it malleable. 4. Transfer the sheet pan to the refrigerator and chill for a minimum of 6 hours, but preferably overnight. Garnish cakes with chocolate covered espresso beans, chocolate shavings, or leftover ground wafers before serving. I know I have been missing in action for a bit. Things have been crazy and really I have just been cooking some of our favorite recipes and not trying a lot of new stuff lately. However when ever there is a potluck or reason for me to bring some food I tend to try new dishes to see how they turn out. This Bacon Gorgonzola Chicken Salad that I found over at Picky Palate was one of those. Since I first made it I have made it at least 3 more times and every time it has been a hit. If you are short on time stop by your local grocery store and pick up a rotisserie chicken to make things even quicker. I baked a few chicken breasts seasoned with salt and pepper and then shredded it up since I had the time and the chicken already. If you are worried about the gorgonzola over powering this chicken salad, don’t be. That was one of the things that I liked the best about it, there was just enough flavor from the gorgonzola without it taking over. Even my husband who is not a fan loved this recipe so give it a try and you might be surprised! 1. Place all ingredients into a large bowl. Stir to combine. Taste and season with additional seasonings if needed. 2. 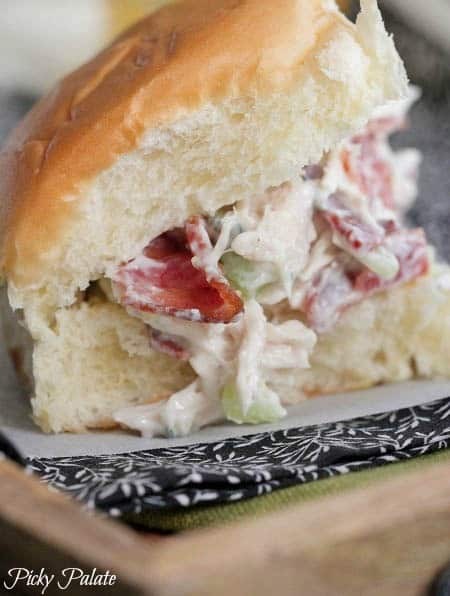 Slice King’s Hawaiian Sweet Rolls and place a heaping tablespoon of Chicken Salad on each roll to serve.